ItemE-03927 - Mrs. Asser, housekeeper for the Burchell's, collecting eggs; Thetis Island. ItemE-03929 - George Roe and Charles Beddis with a recently killed pig; Thetis Island. ItemE-03951 - Unidentified First Nations settlement in the Cariboo. ItemE-03939 - Soda Creek; end of navigation on the upper Fraser River. ItemE-03362 - An unidentified office. ItemE-04684 - Mr. and Mrs. Charles Wilson. ItemE-06446 - A church in Fort St. James. ItemE-05077 - BC fish cannery. 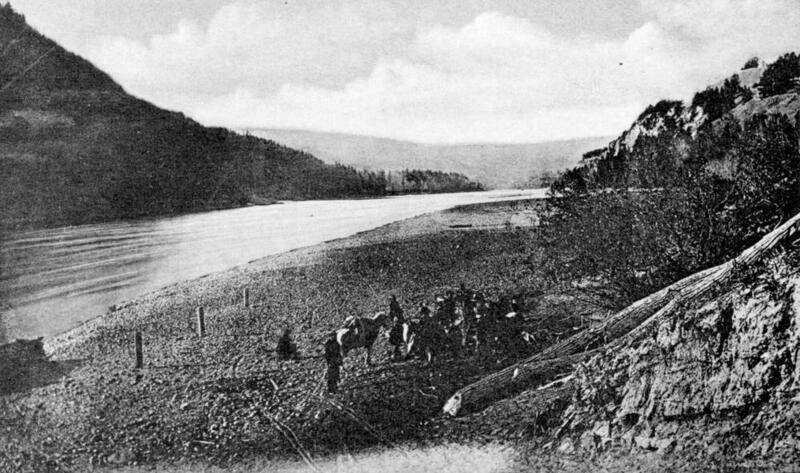 Item E-03939 - Soda Creek; end of navigation on the upper Fraser River.